MANIAC – DEMIMONDE LP OUT NOW! MANIAC are gentlemen punks from Los Angeles. They are what they call a supergroup, being comprised of ex and current members of bands like CLOROX GIRLS, CUTE LEPERS, THE GIRLS, IMAGES, L.A. DRUGZ and RED DONS. Demimonde is their first long player. With echoes of everything from Cheap Trick to early Wire to modern-day greats like The Briefs, Demimonde hits that perfect blend of catchy ’77 punk and jittery new wave. And with all due credit to engineer MARK RAINS at Stationhouse Studios and DANIEL HUSAYN of Red Dons for the mastering job to make this baby loud and raucous. RED DONS – THE DEAD HAND OF TRADITION – FULL STREAM AND DOWNLOAD! RED DONS – THE DEAD HAND OF TRADITION LP is available now for stream and download at the link below. Their first full European Tour in four years kicks off this Thursday in Bremen. We had a slight mishap at the printer with the gatefold jackets of the LP due to problems with the silver and gold ink. This delayed production until this week, all your pre-orders are gonna ship within the next days and the band will have plenty of copies for sale on tour. All records come with a digital download coupon, so if you ordered your vinyl there’s no need to purchase a digital copy. Thanks for your patience, enjoy the record and come see them play! RED DONS are heading back to Europe for a five week trip supporting their new album “The Dead Hand of Tradition” at the end of the month! Below are a new song from the album entitled “Amman (Before the Bomb)” and the tour schedule. Check local listings for updates on the shows and email us at info@takenbysurprise.net with any questions. First track from RED DONS – THE DEAD HAND OF TRADITION LP streaming now! Five years after their seminal “Fake Meets Failure” LP, Red Dons return with their junior album “The Dead Hand of Tradition,” set to be released August 10th on Taken By Surprise Records in Europe and later this summer by Deranged Records in North America. A lot has happened in those five years. Two of the band’s core members Douglas Burns and Hajji Husayn left their hometown Portland, Oregon behind, for Chicago and London. They recorded and released a slew of singles on labels like Grave Mistake and Dirtnap (including a collaboration with TV Smith of UK punk legends The Adverts). Despite the distance between them, they’ve managed to tour regularly in North America and Europe. In January this year they reconvened in Portland to record “The Dead Hand of Tradition” at Buzz Or Howl Studios, the same establishment where they recorded the album’s predecessor. “The Dead Hand of Tradition” features ten new tracks of their signature dark, driving, melodic punk rock sound. The formula of their distinctive songwriting hasn’t changed, but has matured as a result of having five more nomadic years under their belts. These new experiences have only added to the themes of alienation, emigration, and loss present in their music. With Red Dons stalwart Richard Joachim on drums and recent recruit Ruby Sparks of The Stops (Dirt Cult Records / Sabotage Records) on guitar, the band just finished a Midwest / Canadian tour including an appearance at the Ottawa Explosion Fest last month and is returning to Europe for five weeks in the fall. Pre-order limited white vinyl HERE! Find the opening track “The Good Disciple” streaming at the link below. 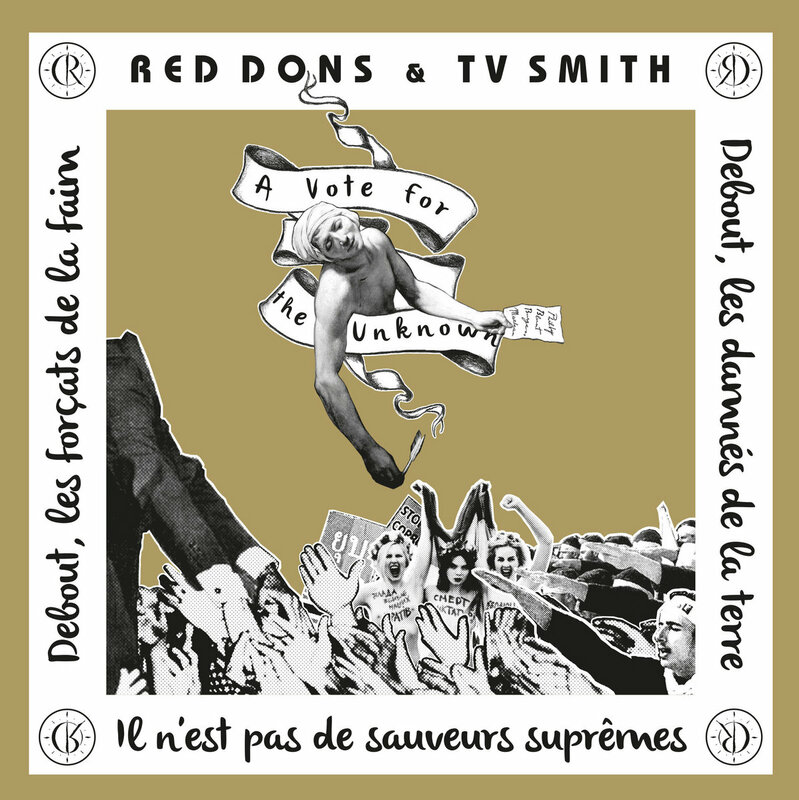 RED DONS + TV SMITH – A VOTE FOR THE UNKNOWN 7″ PRE-ORDER! A VOTE FOR THE UNKNOWN is a collaborative effort between punk legend TV SMITH and the RED DONS. The former ADVERTS front man provides the lyrics and vocals to music recorded by the band. Tracked in a Swedish bomb shelter and mixed by Hajji Husayn at the NORTH LONDON BOMB FACTORY, this record is a must have for any ADVERTS fan looking for one more offering from TV SMITH backed by a punk band. Edition of 500 copies on black vinyl in screenprinted sleeves. RECORDS ARE SCHEDULED TO SHIP MARCH 21! ENDLESS COLUMN – SUMMER 7″ PRE-ORDER! ENDLESS COLUMN started in 2010 when Doug Burns (OBSERVERS, RED DONS) moved to Chicago and started the band together with Jimmy Hollywood (TYRADES), David Wolf (DAYLIGHT ROBBERY) and Eric Watts. They deliver rocking lo-fi garagerock with surfy undertones. These four songs are taken from their demo, recorded and mixed entirely on a Tascam 246 in the summer of 2011, and mastered by Daniel Husayn at North London Bomb Factory. The band went on a hiatus after Burns moved away for school for two years in 2012 and is now back together playing shows again. One time pressing of 500 on black vinyl in screenprinted sleeves. Released in cooperation with TWINTOE RECORDS. RECORDS ARE SCHEDULED TO SHIP MARCH 10! THE CRY! EUROPEAN TOUR 2015! THE CRY! are finally coming to Europe, thanks to our good friends over at OTIS TOURS and WILDWAX SHOWS! Both their albums are being repressed right now and will be available at all the shows! Enter your email address to follow TBSR and receive notifications of new posts by email.